[164 Pages Report] Technology is creating advanced opportunities in the automotive VVT & start-stop system market, and companies are striving hard to take maximum advantage of the new technology. Technologies such as cam-phasing plus changing, which incorporate the valve lift mechanism along with valve timing, are being adopted by various manufacturers in their vehicles. The start-stop system manufacturers are focusing on developing and delivering systems that can meet the increasing demand for fuel economy and emission norms. Thus, the market for VVT systems is estimated to grow at a CAGR of 5.28% from 2017 to 2022, from USD 35.85 Billion in 2017 to USD 46.36 Billion by 2022. Similarly, the market for start-stop systems is estimated to grow at a CAGR of 18.86% from 2017 to 2022, from USD 4.68 Billion in 2017 to USD 11.10 Billion by 2022. With automobile VVT & start-stop system technologies becoming sophisticated across the world, it is critical for OEMs to provide them at affordable prices. 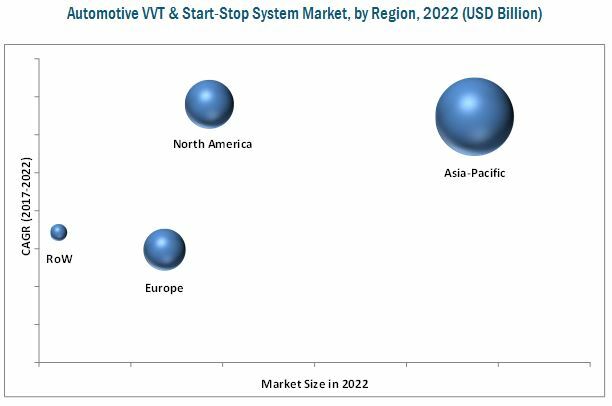 The report segments the VVT & start-stop system market by valvetrain type, technology, fuel type, vehicle type, electric vehicle type, and region. The report defines and forecasts the market size of VVT & start-stop system in key countries for passenger cars and commercial vehicles. In addition, the report provides market dynamics, recent industry developments, profiles of key manufacturers, and competition mapping on a global level. The research methodology used in the report involves various secondary sources including paid databases and directories such as MarkLines, Organisation Internationale des Constructeurs d'Automobiles (OICA), Society of Automotive Engineers (SAE), and Automotive Component Manufacturers Association (ACMA). Experts from related industries and suppliers have been interviewed to understand the trends in the VVT & start-stop system market. The country-level model mapping has been done for the vehicles manufactured in the particular country. The bottom-up approach has been used to estimate the market size. 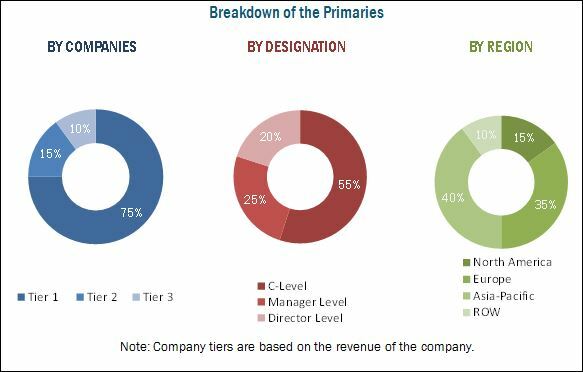 The figure given below shows the breakdown of the profile of industry experts who participated in primary discussions. The VVT & start-stop system market ecosystem consists of manufacturers such as Continental AG (Germany), Denso Corporation (Japan), Delphi Automotive, PLC (U.K.), and Robert Bosch GmbH (Germany); battery and part suppliers such as Infineon Technologies AG (Germany) and Renesas Electronics (Japan); vehicle manufacturers such as General Motors (U.S.), BMW (Germany), Toyota Motors (Japan), and Hyundai Motors (South Korea); and regional automotive associations such as Society of Indian Automotive Manufacturers (SIAM), Japan Automotive Manufacturers Association (JAMA), and European Automobile Manufacturers Association (ACEA), among others.